Maincrop rhubarb is in season right now and it tends to grow like wildfire. It isn’t as pretty-pink as the forced rhubarb that you find in the shops earlier on in the year and it has a more intense flavour. 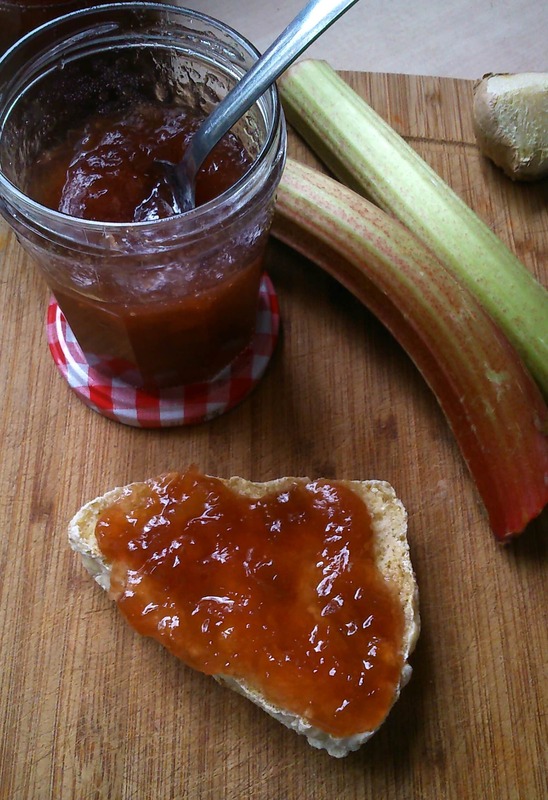 The rhubarb I used to make this jam came from my Mum’s back garden. Thanks Mum! First of all, sterilise your jars. This is very easy – all you need to do is soak them in a sink full of extremely hot water, give them a good scrub then rinse, shake off excess water and place in a very low oven (100c) to dry them. Sterilise the lids exactly the same way. Or if you have a dishwasher, just pop them in alongside your normal wash cycle. Place a small dish in the freezer for the “wrinkle test”. Bring all of the ingredients, except the crystallised ginger and syrup, to a boil. Turn down the heat slightly and simmer for around 15 minutes, stirring often so the mixture doesn’t catch. Don’t be tempted to walk away and leave it – the last time I did I ended up with a pan of rhubarb toffee. What a mess. Not to mention a waste! A sugar thermometer is handy here if you have one – setting point is 104C. Take the pan off the heat. Go and get the little dish from the freezer. Place a small amount of jam on the dish. Leave for about 30 seconds, then lightly push the jam with a finger – if it looks like it is forming a skin and wrinkles, it’s ready. If it isn’t wrinkling, pop back on the heat and try again in a few minutes. 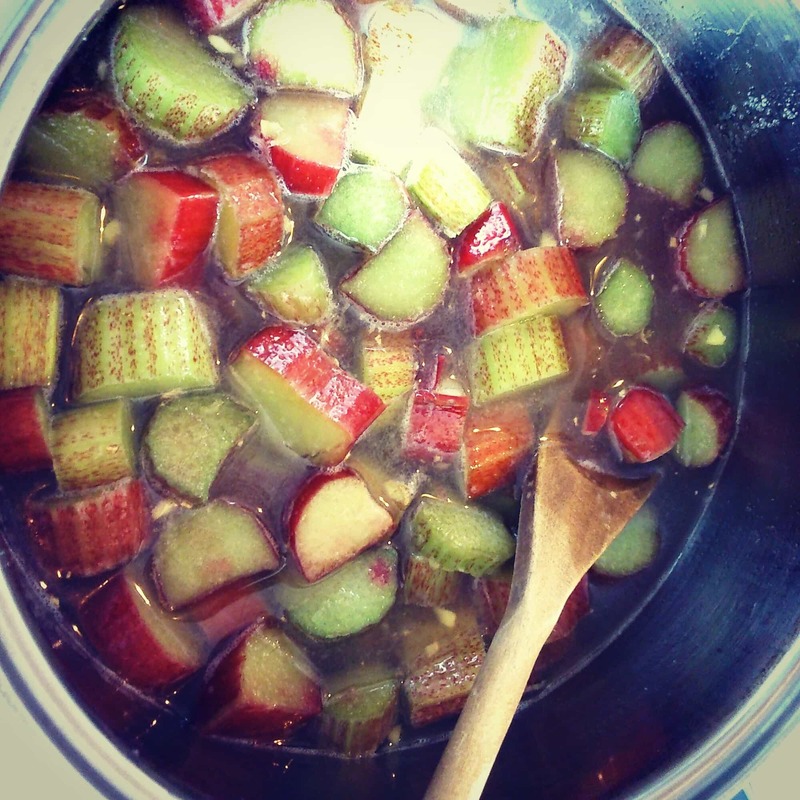 Rhubarb is naturally low in pectin, so it might take a little longer to reach setting point. The jam sugar is supposed to help but I had to do the wrinkle test five times before this batch was finally ready! The end result is worth it, I promise you. When the jam is ready, stir in the chopped crystallised ginger and syrup, if using. Decant into your prepared jars. Intend to make this jam tomorrow. 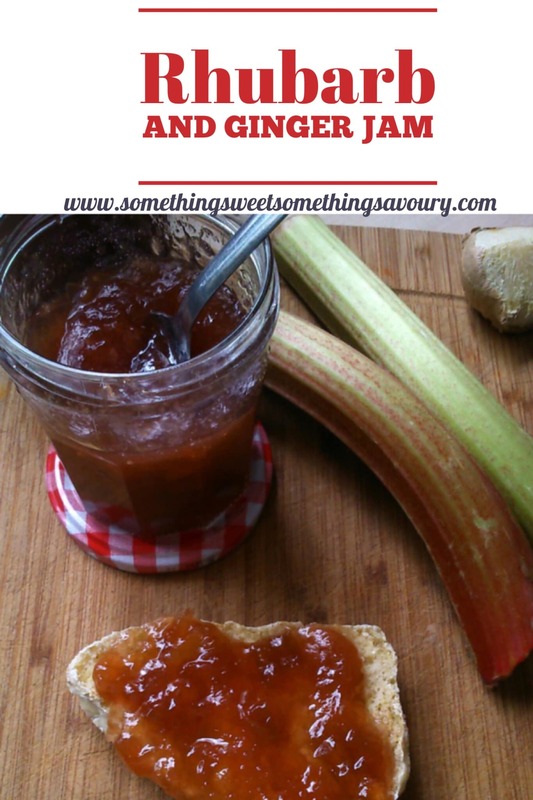 I love rhubarb jam but haven’t made it for years. Thanks for the reminder! Hi, thanks for liking my post on Vim and Vinegar! It was my first post so encouragement is greatly appreciated. Also very impressed with your jam making skills. The last time I tried to make jam I burnt apricots an inch thick on the bottom of the saucepan. I love rhubarb jam, though I’ve never tried to make my own. Perhaps I’ll give it a go. I’m glad you’re using the rugged stuff though — I think all the pretty pink stems in books and magazines put people off using what’s probably lurking in their back garden! I am so glad to see this recipe since I just got some fresh rhubarb from our local farm! This looks like the perfect thing to make with it. Btw what is jam sugar? Can I use regular sugar? thanks so much! Sorry for the delay in replying. Jam sugar is sugar with pectin. You can use regular sugar but you will probably get a looser set jam. Hope this helps! that’s good to know. thanks so much!